Multi-day backpacking requires good sleeping equipment which keeps you warm and comfortable during the nights. A sleeping bag is the most important item of sleeping equipment because it reduces the convective heat loss by trapping the body-warmed air. However, the convective heat loss can be reduced further with a high-quality backpacking sleeping pad. A sleeping pad reduces the heat transfer between the sleeping bag and the cold ground underneath you. Note that sleeping bags provide very little warmth on the underside because the insulation (down or synthetic) gets deflated by the weight of your body and thus cannot efficiently trap the body-warmed air. Self-evidently, a sleeping pad also increases your comfort by providing cushioning. 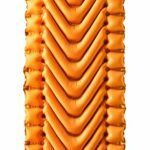 In the following we selected and reviewed the best backpacking sleeping pads to make your buying decision a little easier. We only listed lightweight products which pack small and provide good warmth. If you also need a sleeping bag, check out our review of the Best Sleeping Bags where we selected high-quality and lightweight mummy sleeping bags. 1. Buying a Backpacking Sleeping Pad – What is important? 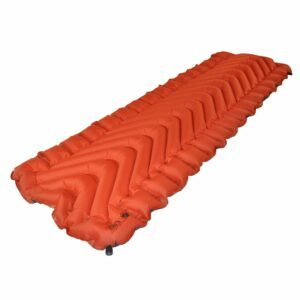 There are two different types of backpacking sleeping pads; foam sleeping pads and inflatable sleeping pads. 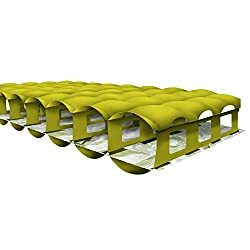 Foam sleeping pads are very reliable and relatively inexpensive. You can also easily modify them – for example cut and shape them to fit your body better and thereby reduce their weight and packed size. 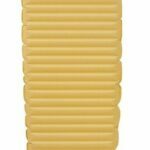 Inflatable sleeping pads pack smaller than those made of foam and provide more warmth and better cushioning. However, they are also pricier. It’s up to you which one you buy but keep in mind that foam sleeping pads don’t provide enough warmth for winter conditions. They are also relatively bulky and thus not suitable for mountaineering, alpine climbing etc. In this selection we listed four inflatable sleeping pads and one foam sleeping pad. The insulation of a sleeping pad is measured by the R-value. The higher the R-value, the more warmth it provides. The R-value is a linear measurement, meaning that a product with the R-value of 5.0 is five times warmer than a product with the R-value of 1.0. Read more about R-value here. Sleeping pads usually come in two sizes (regular and long) which differ in length and sometimes also in width. If you are not taller than 6 ft. you will be fine with the regular size (true for most sleeping pads). Otherwise, go for the long model. Sleeping pads are not among the lightest items of backpacking gear and therefore you should aim to get a lightweight backpacking sleeping pad. In this selection we only listed lightweight products. Learn why lightweight gear is important for backpacking in our article Why hike lightweight. When it comes to cushioning, consider where you usually camp – some areas offer great natural cushioning (moss, grass) while others are less accommodating (rocky terrain). If you often camp on rough terrain, an inflatable sleeping pad is a better option for you because it will provide better cushioning. Dimensions 20 x 72 x 2.5 in. 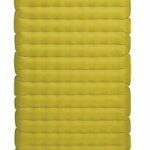 The Therm-a-Rest NeoAir Xlite backpacking sleeping pad is super light – it weighs merely 12 ounces. It is made of 30-denier nylon which provides great abrasion resistance and durability. 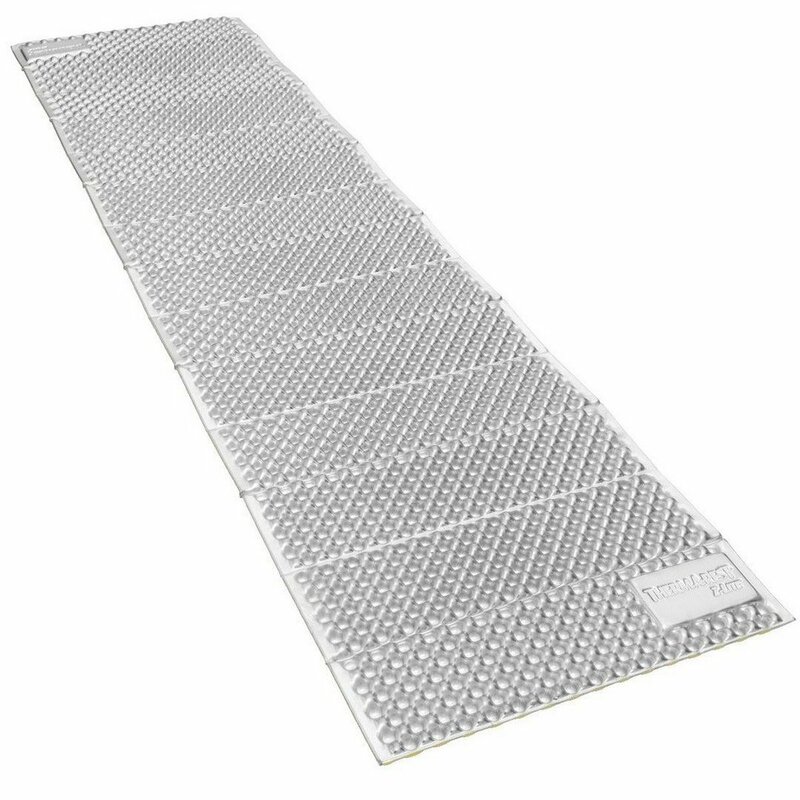 The NeoAir Xlite sleeping pad has two stacked layers of triangular baffles on the inside which efficiently decrease the conductive heat loss. 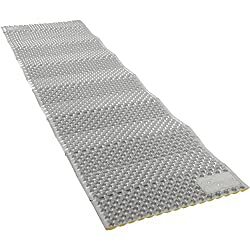 This two-layer baffle construction also enhances the stability of the sleeping pad. The NeoAir Xlite sleeping pad is also equipped with a reflective coating (ThermaCapture technology) which is placed between the two inner layers and reflects radiant heat back to your body. According to the Therm-a-Rest, this technology increases the warmth for 50%. The result is an R-value of 3.2 – which is indeed good considering that the sleeping pad does not have any insulation material. The Therm-a-Rest NeoAir Xlite can be inflated by breath (requires approximately 30 breaths) or with a pump. The pump is sold separately by Therm-a-Rest. The Therm-a-Rest Z Lite Sol is a foam sleeping pad. Therefore, it has a lower R-value than the other products in this review. However, it is also less expensive and has a longer lifespan. 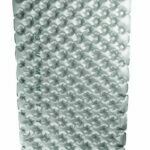 The Z Lite Sol sleeping pad is made of crosslinked polyethylene foam which is shaped in a wave pattern for better insulation. The foam is denser at the bottom and softer at the top for better comfort level. This backpacking sleeping pad also has a reflective coating (ThermaCapture technology) which reflects the body heat and thus makes the sleeping pad warmer. The Therm-a-Rest Z Lite Sol sleeping pad has an R value of 2.6 which is indeed good for a foam sleeping pad. The Nemo Tensor 25L backpacking sleeping pad is another great option for backpackers. The outer layer of the sleeping pad is made of lightweight 20-denier ripstop polyester. The Nemo Tensor 25L sleeping pad has a frame for better stability and a reflective film for better warmth. Unfortunately, Nemo does not state R-values for their products, but they do claim that the Tensor 25L can be used at temperatures as low as 30 F. The sleeping pad comes with a stuff sack for easy packing; compressed it measures only 9 x 3 inches. 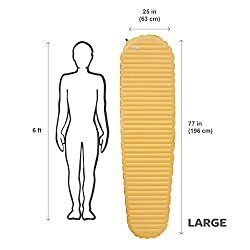 The Nemo Tensor 25L sleeping pad is also available in a mummy shape (Tensor Mummy) and with insulation layer (Tensor Insulated). The insulated model uses Primaloft insulation and is warmer, but also heavier than the 25L model. The Klymit Insulated Static V Lite is a budget insulated sleeping pad which offers a lot for the price. It is made of abrasion-resistant 30-denier polyester and has a layer of Klymalite synthetic insulation. The insulation material is placed inside the chambers and significantly increases the warmth of the sleeping pad. Therefore, the Klymit sleeping pad has an R-value of 4.4. However, the insulation material makes this sleeping pad a little heavier. The Klymit Insulated Static V backpacking sleeping pad also has an anti-microbial laminate inside the chambers which prevents the growth of fungus and bacteria. It can be inflated by breath (requires approximately 10 breaths) and comes with a stuff sack for easy packing. The Sea to Summit Comfort Plus sleeping pad is the heaviest product in this review. However, with an R-value of 5.0 it provides superb warmth. The sleeping pad is made of 40-denier ripstop nylon and utilizes two-layer design. The two layers are not connected, meaning that they use separate valves and thus allow you to inflate each layer to your liking. Should you accidentally puncture one layer, the other layer will remain completely functional. The Sea to Summit Comfort Plus backpacking sleeping pad also features the Exkin Platinum reflective film and Invista’s Thermolite insulation. It comes with a repair kit and a stuff sack; packed, the The Sea to Summit Comfort Plus sleeping pad measures merely 9 x 5 inches. What are sleeping pads for? Sleeping pads keep you warm and comfortable during the nights. They decrease the heat loss between the sleeping bag and the cold ground, and provide cushioning. What is the most comfortable sleeping pad? Inflatable sleeping pads are typically the most comfortable because they are soft and create distance between the ground and your sleeping bag. Do sleeping pads go inside sleeping bags? No, sleeping pads go under the sleeping bags. A Sleeping bag provides warmth and therefore it should fit snugly around your body. 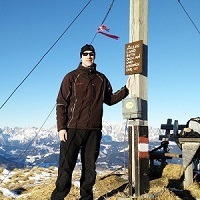 ← How to choose food for a hiking trip?